One of the perks of living in Savannah is that we have so many charming neighbors. Charleston is one that always ranks high on the list when friends come for a visit and want to go exploring! Understandably so, since the Holy City is filled with incredible places to eat and a plethora of pretty pink houses to photograph. But because it's often difficult deciding what to do in a city with so much to offer, I created a handy Charleston Bucket List printable and itemized a few popular (plus some less-touristy) options to get you started. Download the Charleston Bucket List printable pdf here. This list is interactive, so check each item off the list as you go! I've tried to include a wide variety of things to do that include cultural and historical landmarks, Instagrammable locations, incredible places to dine, and fun things to do with kids. Read below the list to find additional details about some of my favorite activities, plus tips about the best time of year to visit! Visit Cypress Gardens — the location where many scenes from The Notebook and The Patriot were filmed. Shop your heart out on King Street, named as one of the Top 10 Shopping Streets in the U.S.
Every item on the list above is incredible and worth experiencing, but I wanted to take a second or two to include a few additional details about some of my favorites on the list. You'll find all sorts of wildlife at Shem Creek, but the bottlenose dolphin is my personal favorite; they're so playful and inquisitive! Rent a kayak to get up close and personal with a pod, or charter a boat if you prefer keeping a little distance between yourself and the water. While you're out exploring the creek, be on the lookout for manatee, owls, and otters. I make no secret of my love for sea turtles, so you know I'll jump at any chance to help further their conservation and rescue efforts. At Zucker Family Sea Turtle Rescue™ (part of the South Carolina Aquarium) you can learn about every step of a turtle's rehabilitation journey. Each of the turtles in the rehab center has a tablet next to its tank detailing what led it to the center and outlining the steps in its recovery process. There are also mock med stations where you can learn about sick turtles and then help “diagnose” their conditions. The best part? You can adopt your very own sea turtle for $35 or become a Sea Turtle Guardian for as little as $10 per month! Alabaster is a rare albino (all-white) alligator. He's one of less than 100 currently known to exist, and he lives in the Blackwater Swamp exhibit at the South Carolina Aquarium. He's a rescue alligator and — due to his rare condition and sensitivity to light — he can never be returned to the wild. (Albino alligators have less than a 2-day survival rate in the wild.) He's getting pretty old, so go visit him while you still can! The swamp gardens are on the grounds of Magnolia Plantation, and they make a great place to spend a few hours if you're a shutterbug or a nature lover! There are little “sunning decks” throughout the swamp that alligators climb on to bask in the sun, and you can get the coolest pictures of them when they climb atop one. The swamp water is covered in a bright green algae-like substance called duckweed, and when the alligators climb onto the sunning platforms they're often covered in the neon green substance, which makes for some very unique photo opps. Even when they're not sunning themselves, you might catch a shot like this incredible one of a hungry alligator grabbing a bite to eat from an unsuspecting subject (poor fella!). There are also some really nice photo opps if you keep an eye out for bird nests up in the trees and along the banks of the swamp and the walking trails. Egrets and heron are the most popular, but you'll spot others if you pay close attention. At any rate, pack your best zoom lens, because you'll find plenty to shoot! Even if you're not into wildlife photography, the azaleas bloom from mid-March to April and a shot of them reflecting on the water is pretty incredible and very ‘Southern Living-worthy'. Learn about the inhumane practice of slavery — which is unfortunately synonymous with Charleston and the Deep South — at the Old Slave Mart Museum. It once served as a private auction house where men and women were sold to some of Charleston's most prominent plantation owners. The museum currently offers a treasure-trove of information about the formerly enslaved and the horrific treatments they endured. It's a thought-provoking and moving experience, and one I highly recommend to anyone visiting the Lowcountry. From the Slave Mart Museum to Calhoun Mansion…you'll discover two completely opposite ends of the wealth spectrum by exploring both locations. Calhoun Mansion is the largest single-family residence in the entire city, and it serves tribute to the Gilded Age when excess wealth was on display even as many lived in abject poverty. The 24,000 square foot mansion is quite a showpiece. It features 35 fireplaces, Tiffany-designed lighting, and an extensive private collection of art and antiques worth millions of dollars. If you've ever wondered what it might be like to live like a Trump (no thanks! ), this and the Biltmore House in Asheville offer two of the closest peeks you can get into that type of over-the-top lifestyle. The best times of year to visit Charleston are during early spring and fall. Southern winters are very mild, so the weather is comfortable for exploring as early as late February. The holiday season is also drop-dead gorgeous, especially since many of the homes are decorated so beautifully! This adorable Fixer Upper-style farmhouse features 2 incredibly comfortable swinging beds and is only minutes from Drayton Hall, Middleton Place, and Magnolia Gardens. Click here to receive a $40 Airbnb credit from me on your rental!! I hope these options help. 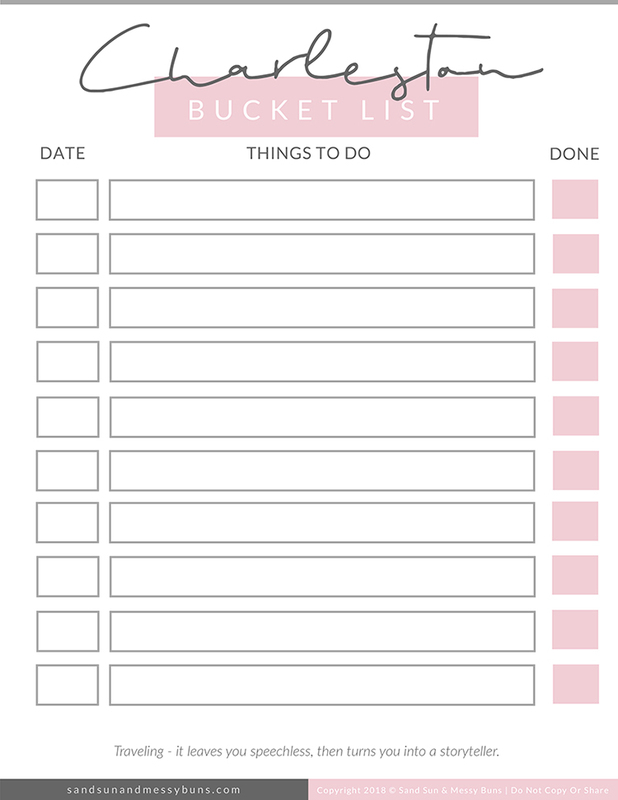 If you'd like a Charleston bucket list printable that comes pre-filled with some (or all) of the above-listed items, please let me know so I can add that option to this post. I want to make sure I'm delivering the content you need! Thanks so much. For more local favorites, you can follow my Charleston board on Pinterest or join my email list where I spill my secrets about my favorite places to explore in and around the Lowcountry. Ooh! We’re planning on taking a trip down this summer! I’ll add some of these to our list! Not yet, she’s further west in Fayette County. We want to head there too though so I will keep an eye out for your list!